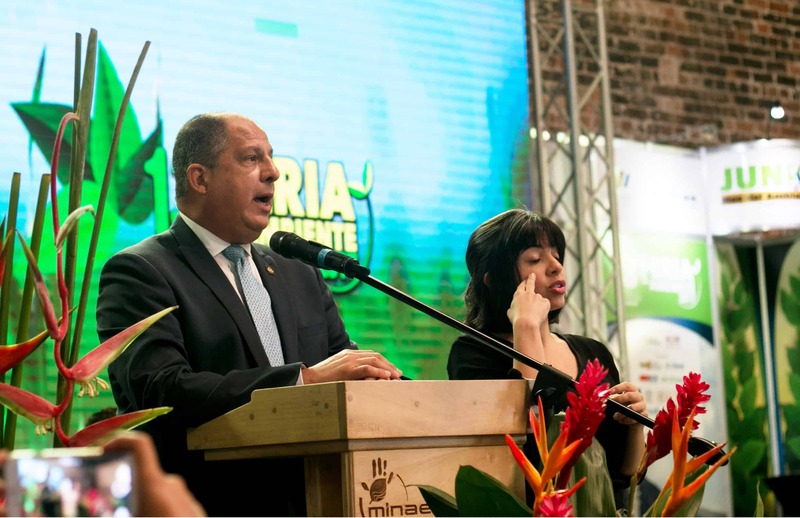 Costa Rica seeks to be free of single-use plastic, and top officials including President Luis Guillermo Solís disclosed the details of a national strategy to achieve that goal during a public event to celebrate the World Environment Day on Monday. Officials from the Environment Ministry (MINAE), the Public Health Ministry and the United Nations Development Programme (UNDP) outlined the strategy to replace the consumption of plastic products with those manufactured with renewable and compostable materials. The main objective is that, by 2021, at least 80 percent of the country’s public agencies, municipalities and businesses replace their disposable plastic packaging with materials that have a lower environmental impact. MINAE announced at the event that it has already ordered all its departments to purchase only products made from renewable, compostable and biodegradable materials. Health Minister María Esther Anchía said that Costa Rica generates 4,000 tons of waste every day. Of these, 11 percent correspond to plastics that end up in rivers that carry them to the sea. “Plastic bottles, for example: Ticos discard 1.5 million bottles every day,” Anchía said. Non-governmental organizations including the Costa Rica USA Foundation for Cooperation and MarViva, as well as the National Chamber of Retailers, have already joined the plan and are publicly supporting its actions. Environment Vice Minister Fernando Mora said at the event that the strategy does not represent an attack to any private-sector market. “What [the plan] does is to promote better disposal of solid waste under a national recycling strategy and to offer our citizens alternative packaging materials,” he said. The strategy focuses on the consumption of single-use plastic, which takes hundreds of years to break down. This includes plastic bags from retail stores or supermarkets, straws, coffee stirrers, bottles and other containers. Mora said that this kind of waste represents a threat to modern societies, and that the lack of adequate disposal and management of these materials is endangering marine resources. “Recent studies from international agencies estimate that by 2050 there will be more plastic than fish in the sea,” the Vice Minister said. The initiative calls on Costa Ricans to replace single-use plastics with non-petroleum renewable, marine biodegradable and compostable materials. This means that products should biodegrade within six months — even in a marine environment — and transform into compost, the first stage in the biodegradation of all organic matter. For more information, visit the campaign website, www.zonalibredeplastico.org, which includes a database of companies in Costa Rica offering renewable and compostable products. It also allows individuals or companies to register their own products or companies for the campaign.